Guy 1: "Knock Knock: Knock, Knock." Guy 2: "Who's There: Who's there?" Guy 1: "Knock Knock: Don't you understand that communication is impossible?" The first section of the disc features 3 very short films, all of which are called Chaos. One is aquick video segment of skateboarders having horrible painful accidents while trying to performimpressive tricks. The second Chaos short is a brief animated piece. Last is a film about"animals going bad," and it certainly provides a good laugh or two. 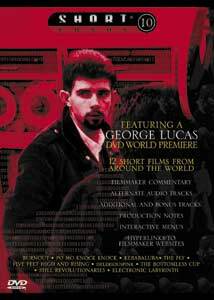 Lucas' legendary short film (one of a handful he made while at USC) is presented here in it'sentirety. Electronic Labyrinth, for those of you unfamiliar with it, was the source forLucas' first major film, THX-1138, and is arguably one of his best works considering theexperimental and surreal nature. The film tells the story of a man (THX-1138) attempting toescape from an overly controlling and oppressive mechanical society. The feature film heavilyexpanded the concept and used bigger actors and effects. Along with the film is included a shortinterview clip with one of George Lucas' instructors at USC and a brief explanation of what theTHX/Lucasfilm audio standard means. The longest feature on the disc is this 30-minute piece that follows the life of a young boy in anurban city neighborhood. Using amateur casting and real neighborhood kids, the film succeeds asa very realistic portrayal of this child's day. The film is accompanied by a commentary track withdirector Peter Sollett. This is a very short animated piece of life as seen through the eyes of a fly. It won an Academy Award® in 1980 and has long been a fan favorite of short film festivals. This animated piece is a very humorous, short portrayal of a Turkish eatery owner. The actualfilm is accompanied by a recipe for Doner Kabob (better known as 'Gyros') as well as some otherfunny tidbits about the short. Running about 15 minutes, this feature is a very well made, small documentary about two womenwho were once part of the Black Panther movement. The documentary marks an interesting turnin the media-based history of the Black Panthers in that it focuses on their social programs andcommunity outreach programs more than the typical, violent image they gained. An informativecommentary by the director is included. Directed by Andrew Busti & Sebastian Castillo. This piece is a short, experimental film done entirely with frames created using a xerox machine,with only a musical soundtrack as accompaniment. I didn't like it very much, but it's still aninteresting technique. A commentary with the directors is included, though short. Probably the best offering on the disc (other than Electronic Labyrinth) is this film abouta weird encounter that a driver has at a late-night diner. Includes a commentary track and aninterview with the actress who plays the waitress in the short. This short is a satire of "artsy" type movies, featuring two guys telling 'knock-knock' jokes to eachother in black-and-white, using a very Ingmar Bergman style approach. It's pretty funny and thefact that it's only about 3 minutes long means the joke isn't stretched thin. A serious commentary trackis included, as is an alternate "special edition" commentary where the cast and director arewatching The Matrix instead of their own film. A second short film, Po Mo LoveDoc is also included that follows up on the relationship between characters from the short. This unusual film is a sort of meandering pseudo-documentary about a truck driver, set to verybluesy music. It has won several awards and was featured as part of the Sundance Film Festival,but I have to admit I didn't really like it much. Regardless, it's well made and an additionalcommentary track with the director is featured. The rest of the disc is just little humorous snippets and weird stuff (including the disc credits),with nothing really significant beyond the short films. While all these films make a good viewing,the disc seemed a little thin on material, especially since most of the films are so short. Image Transfer Review: Most of the shorts are 1:33:1, with only one (Burnout) presented in 1:75:1. The imagequality is excellent, with no signs of compression artifacts or pixelization problems. Even aheavily aged film like Electronic Labyrinth comes across with vivid detail. Most of thefilms use very low-tech methods, so the source prints are not High-Def quality or anything, but thetransfer here is without substantial flaws, probably maxing out the space on the disc. Audio Transfer Review: Much like my experience with Quickband's Circuit music DVDs, the disc uses Dolby 5.1sound for everything on the disc. These mixes are not specifically engineered for the films,however, but rather awkward ones where the mono sound data is pumped into each channel. Theresult is a very harsh sound mix that's very distracting. It's not real surround sound, it's just loud. Thankfully, this doesn't really hurt any of the films, but it does exaggerate source flaws like hissand tape hum. The only portion of the disc with 'real' 5.1 sound (true directionality) are themenus. Extras Review: The production notes and commentary material for the short films make a nice bonus for each separate film. Other than that, the disc doesn't really have much else, but then it doesn't reallyneed much else. There is a trailer for The Perfect Storm, as well as a teaser for the nextvolume of Short. Short 10 is another good dose of unusual and amateur filmmaking. I'm not sure, though,whether or not this would warrant a purchase or a rental. I'd have to lean towards rental. Thedisc does, however, make the incorrect assumption that because it has ElectronicLabyrinth this is the first DVD of a George Lucas film. Actually, Lucas' AmericanGrafitti has been on the medium for over 2 years. Oops! Regardless, I recommend the disc.